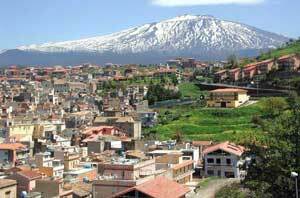 The foreigner who has had the opportunity of visiting our town, has certainly admired the city’s panorama cut into the Etna majestic outline. Its position and conformation however doesn’t favor an easy accessibility and its history is somewhat hidden by the black lava stones of its old constructions. And yet Bronte’s history is made of pains, tensions and revolutions that have made it known in the world. Ironically it was a personage not particularly loved by the brontesi, Horace Nelson, that gave fame to the city of Bronte and favored, even if indirectly, the propagation of its name in the world. Something even stranger: Bronte’s citizens never came to know Horace Nelson, to whom were gratuitously enslaved for state reasons. And those who were abroad at the origin of Bronte’s place names did never know the original Bronte. The tenth of August 1798, at Abukir in Egypt, the English admiral Horace Nelson had carried off a resounding victory over the French fleet. The 24th of June 1799, the same admiral, saved the Neapolitan kingdom by crushing the Neapolitan uprising. King Ferdinand 1st of Naples and Sicily decided to reward him by making him duke of a territory , that the king himself did not know, situated in the East of the island, at the feet of mount Etna: Bronte. The victories carried off by Horace Nelson made him famous and admired by many people all over the world. What favored the diffusion of the name, however, was England imperial and colonialist system. Let us see now how the name was diffused. When I arrived in Sydney, in January 1973, my host, Joseph Greco, told me that one of the suburbs of Sydney was named Bronte. In fact two places carry the name of Bronte, one is the actual suburb of Bronte, situated on the east side of the city of Sydney, capital of the New South Wales State. Robert Lowe, layer and politician 1st Viscount of Shefbrooke, in 1842 had moved from England to Australia, where vehemently devoted himself to politics. He published also some articles that brought him good fortune. He bought also a vast estate in Sydney, on the coast and, in honor of Horace Nelson, named it Bronte. The name is locally pronounced “Brontee”. At the number 470 of Bronte road still exists the “Bronte House”, the house that belonged to Robert Lowe. The suburb of Bronte is part of the municipality of Waverley. In 1987 somebody tried to remove the name of Bronte from the name places of Sydney. They wanted in fact to incorporate the area in that of Waverley. It was due to my personal good offices and the taking sides of the local people to avoid such event. In October 1990, while I was having my holidays in Bronte of Sicily I met the then Lord Major dott. Francesco Spitaleri and suggested to him the possibility of a twinning between the two Bornte, unfortunately the lord Mayor had to resign from office in 1991 and nothing was done.The 16th of July 1992 however, came to Australia, in visit to the brontesi of Sydney and Melbourne, Catania’s archibishop Mons Luigi Bonmarito, the vice president of Catania’s province, Dr. Francesco Bruno, the president of Sicilia Mondo Adv. Domenico Azzia, the archpriest of Bronte Don Antonino Longhitano and the new lord mayor of Bronte Dr. Salvatore Anastasi together with other dignitaries. The 20th of July of that year Biagio Meli from Bronte brought together the mayor of Bronte in Sicily and the Waverley Mayor, Mrs Barbara Armitage under whose jurisdiction falls the suburb of Bronte of New South Wales and they spoke of an eventual twinning. The second Bronte of Australia is placed in the State of Tasmania and is called Bronte Park. A relation of Horace Nelson, with the surname Matchams married the lieutenant Arthur Corbett, who moved and settled in Tasmania from 1834 to1863. There he bought a large estate the he called Bronte park in honor of Nelson ducal title. Bronte Park is in the geographic centre of Tasmania, at the crossroads that take to Devonport, Hobart and Queenstown. The extreme north of the southern island of New Zealand forks and embraces the triangular Tasman Bay with two promontories that look towards north. On the corner in which the two promontories meet raises the city of Nelson. Not far from Nelson, a territory is called Bronte. To be noted that here the name Bronte is tied to the name Nelson given to the nearby city. 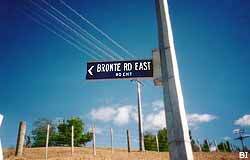 Even in Australia and in Canada the name Bronte is tied to that of Nelson given to the adjacent bay. In the zone south of Toronto many names were given In honor of the Admiral Horace Nelson to commemorate his sensational Trafalgar victory: the city of Trafalgar and the small village of Bronte on the sea. On the territory of this rural centre flows a river called Bronte creek and the bay in which it it flows into is called Bronte Harbor. 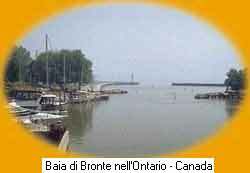 Nowadays Bronte, situated at 40 kilometers south of Toronto, is part of Oakville city in the municipality of Halton. The name is locally pronounced “Brontee”. It was by the pressure of the farmer William Chisolm who in 1828 had bought some hectares of land in the estuary mouth of the Sixteen Mile Creek that on the 30th of December 1833 was submitted to the competent authorities the plan for a new urban conglomeration. The 19th of August 1834 appeared for the first time in the "Gazzetta dell'Alto Canadà" the name of the new small town: "Bronti". Seems that the name was given to the centre in 1888 following a context and was preferred to Bronco, the other name proposed. The name was selected in honor of the writer Charlotte Brontë. The name is pronounced with a mute final “e”: Bront. In 1906 the wooden houses of old Bronte were moved by half a mile, to be placed near the new railway, that was being constructed to connect the western side to the eastern side of the State. Drogheda is the home town of the Anglican priest Patrik Prundy, born in 1772 and dead 1861. In 1800 Patrik’ s father, admirer of admiral Nelson, before leaving Ulsterman to go to Cambridge in England, had changed his surname in that of Brontë. So that the pronunciation of the name would not be garbled in the English language, the Prundy asked for a dieresis over the final ”e” of the name. Care that did not take the Americans of Texas, the Canadians and the Australians, in whose countries the name is respectively pronounced “Bront” and “Bronti”. Patrik was the father of the three famous writers: Charlotte (1816-1855), Emily Jane (1818-1848) and Anne Brontë ( 1820-1849) , authors of respective books: "Jane Eyre", "Stormy tops" and "Agnes Grey". Patrik had followed his father in England and studied at Cambridge. In 1812 married Mary Bramwell. In 1815 was nominated curate at Thomton where the three writers were born. Even the name of the writers then derives from our country town in Sicily. 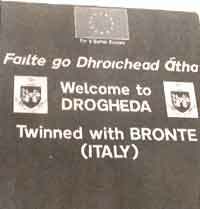 Bronte and Drogheda, twin cities: In July 1987 a big brontese delegation, guided by the Mayor of the time Nino Paparo, was hosted at Drogheda to stipulate the twinning of the two small towns. The act of twinning was renew in June 2002. Charlotte, Emily e Anne Brontë, the three sisters famous writers. It was a great surprise for me as on the night of of March 10th 1994 I received a phone call from Perth. A mr Bronte Patkin of Nedlands, in Western Australia was telling me that his name was Bronte and the surname Patkin. He was searching for the origin of his name. Was born in South Australia in 1950 and was telling me that in South Australia the name Bronte was popular also as a surname. Even in Sydney exist two other people with the surname Bronte. Wanting to know more about his name he had written also to Bronte Park in Tasmania The filing clerk of that centre had given him my name.